In her younger years, she was extremely oral. The ends of lead ropes were her favorite victims of her chewing fetish, and the local tack shops loved me because I predictably was in to buy cheap nylon lead ropes every couple of months. 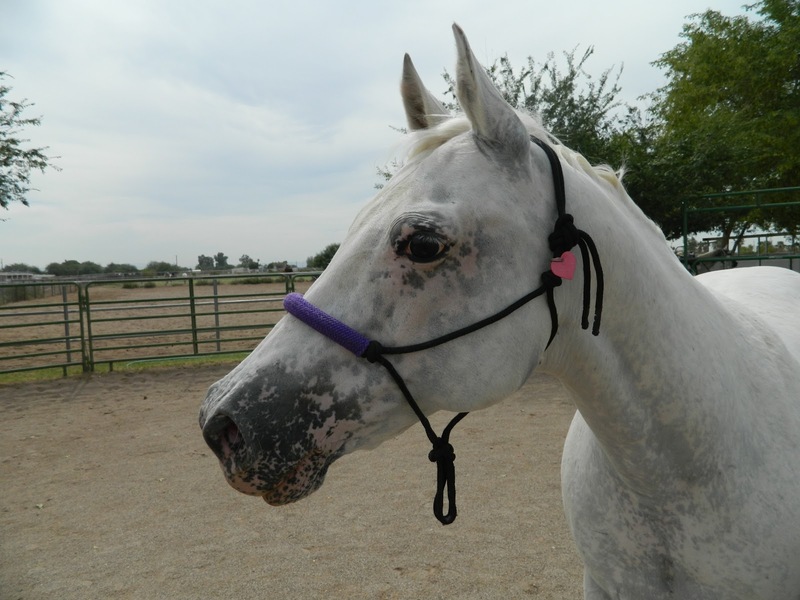 When I wasn’t buying lead ropes, I was buying fly masks or tail bags to replace the ones she had shredded beyond repair. Fortunately, she eventually outgrew the chewing habit, I stopped using tail bags, and flymasks usually last at least a year+ these days. 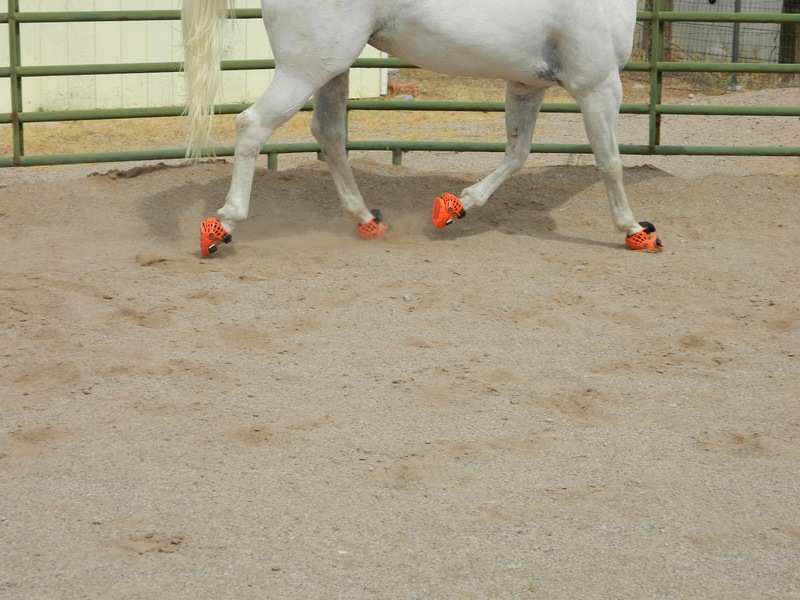 But she is really hard on hoof boots. I pulled her last set of shoes in the fall of 2004 and started using boots. And she promptly started destroying them. I tried everything that was on the market at that time available in her size. With each boot I’d try, or boot modification/fix made, she’d find a new way to wreck it. If there was a part that moved or was somehow attached, she’d find a way to either break it or detach it. I went for a period of time there were just about every week, I was getting a box in the mail with either a new boot or spare parts, and I tip my hat to the truly patient customer service people at, what was at the time, Sportack. I’m not sure what it is about this pony that makes her so hard on boots. 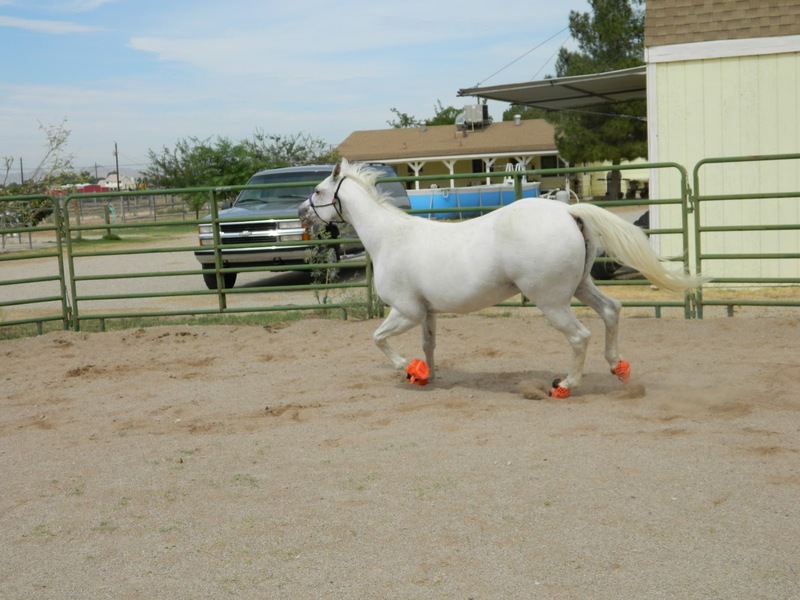 Her movement is very low to the ground… half the time, she just can’t be bothered to pick her feet up if the footing is good. Fast forward through a couple of years of Interesting Times and Expanded Vocabulary to the summer of 2007, when I first started using Renegades on her. That’s five years now that I’ve been using them and they’ve withstood the most pony abuse, even through the different trial-and-error sessions of figuring out what size works best for her. In five years, she’s ripped one boot shell and broken one cable. Worn out countless boot shells and Velcro straps, yes…but that’s only after 500-or-so miles of training and competing. 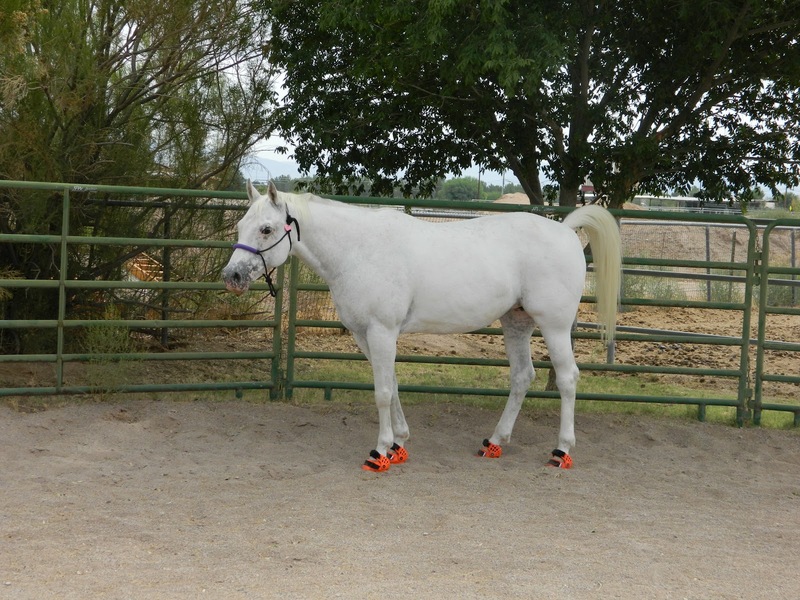 But even after five years, she’s been a head-scratching exasperation to size, especially her front hooves. She’s gone back and forth between a size 00 and 0. When freshly trimmed, her measurements were a classic size 00. 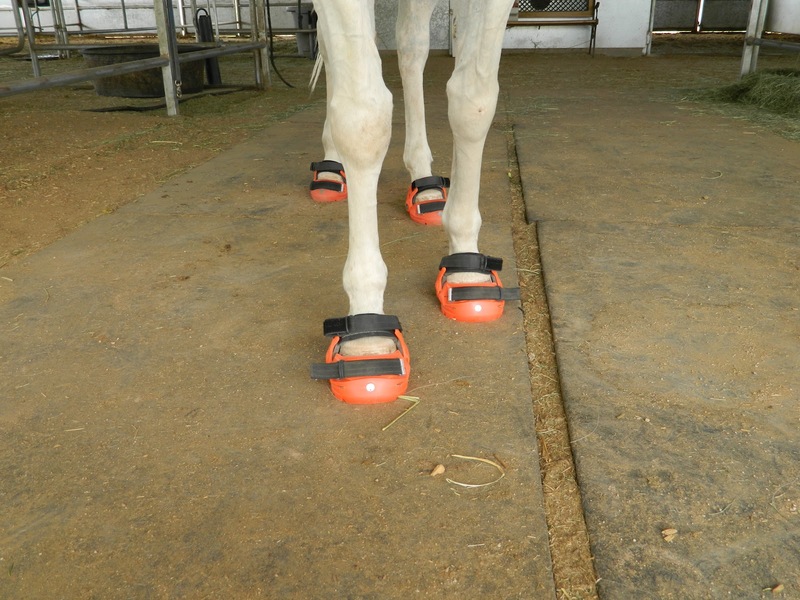 But the shape of the boot didn’t match her hoof quite right, so she always had a gap on the front, and I had to remain diligent in keeping her hoof constantly maintained. So I’d try a size 0. The boot shape was perfect…but they were big on her. Not sloppy, but not ideal either. So going back and forth between sizes has been the story of my booting life with her…until recently. Y’see, I forgot to take my own advice when it came to boot sizing: Their feet grow and change. I’ve gotten so used to her “tiny” feet that I’ve been determined to keep them that way…not taking into account that, no, she’s not “getting long” but that her feet might naturally be getting larger. I’ve been, in essence, “over-trimming” her and doing a major no-no in trimming the hoof to fit the boot, instead of evaluating the hoof for itself and then fitting the boot to match. So Mimi got a break from my zealous over-trimming, and after letting her grow out for a month or so, I had more of a clean slate hoof to work with. A minor trim later, I re-sized her for boots, and she’s moved up almost an entire size. Her fronts now fit into a size 0-Narrow with a Cutback on the length, and her hinds fit into a 00 with a cutback. And then we got to the fun part: the box of shiny new boots with her name (okay, mine, since that’s what’s on the mailbox…) on it. And yesterday, we had some fun putting them to the test in the roundpen. Her outlook on the roundpen is a somewhat haphazard, no-holds-barred, cage-match type of game. Which usually involves bucking, spinning, sliding stops, fast starts, sudden sprints…all the things that make me cringe and wait for her to go crashing into one of the panels. In short, things that will test whether a pair of boots will stay on or not. She starts off all slow and innocuous. So I love the bright orange boots. They look so good on her and they’re so noticeable. The yellow looked good, but I love these even more! all it took to set her off. Once she’s going, she stays going. 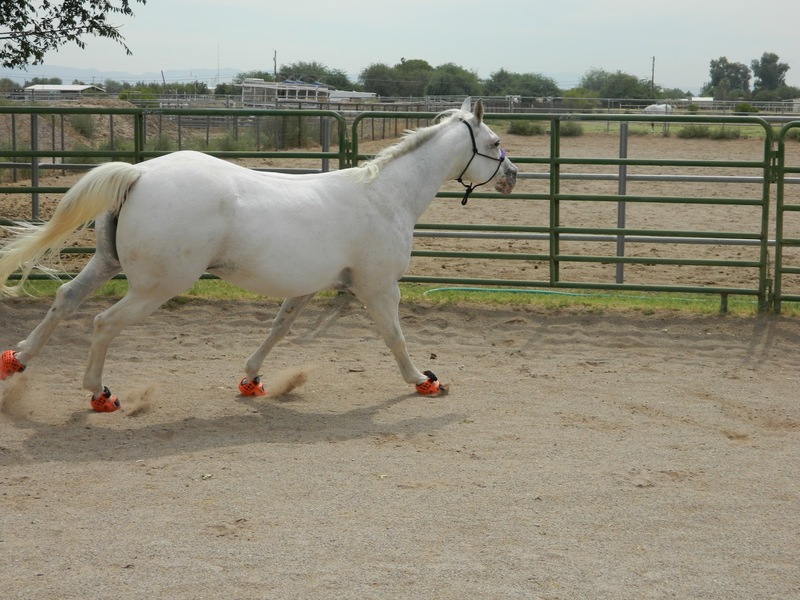 Most of the time, she sticks to a trot. And what a trot she has…still. There’s a reason that she can keep up with 15+ hand Arabs that are cantering while she’s still trotting. And while I rarely allow the big trot (cringing at the thought of tendon/ligament damage), it is pretty to look at. All four off the ground! I would have loved to GPS her. Based on GPSing while riding, I know she’s capable of hitting 13-14mph at the trot. She can make those little legs GO. involves one of her shotgun, drop-and-dig gymkhana starts. 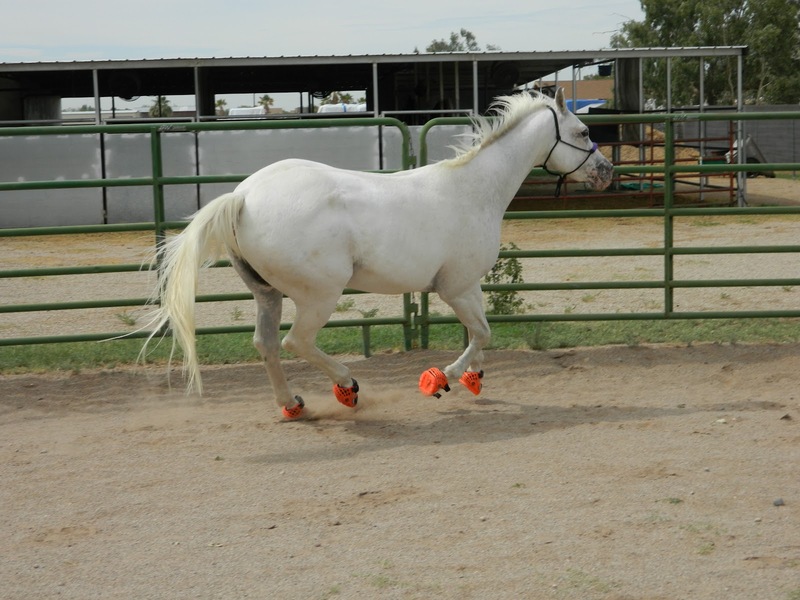 Her canter isn’t the greatest anymore…fused hocks tend to make an already- rough canter even worse. So she usually prefers to trot, and under saddle, I have to really hold her in a frame to encourage a good canter. But in the roundpen, she really digs in and lets fly. I think she enjoys playing in the roundpen. I’ve always kept it low-pressure, choosing to go for more of the fun, “let’s dance” route, versus the “drive you around in fast circles until your little eyes are bugging out and you’re begging to stop” approach. So consequently, it’s more of a game for her. She would do some laps, then she’d slow down and come into the center where I was. She’d pause, I’d scratch her head, then she’d send herself back out and pick up the speed again. I generally let her pick her pace and change directions on her terms, stepping in once and a while to make sure she ends up going both ways an approximately equal amount of time. she still prefers her boots. We’re working on it. She had quite a little ‘tude going yesterday…in a good way. Lots of changes of direction that involved her skidding to a stop, spinning around, crowhopping and kicking up a few times, leaping, half stepping on herself, then sprinting off. All maneuvers that are pretty hard on boots. She put a lot of torque on them, and the roundpen is all sand. When we were done, there was a collective teaspoon or so of dirt/sand in the boots. I’m sure stuff was getting in the boots as she was going…you can see how much sand she’s kicking up in some of the above pics. But the open-back design of the Renegades allows most of the sand and dirt to filter out. And the best part was that after her workout, her boots hadn’t budged. The pic of her displaying her new boots in the barn aisle was actually taken after her workout, and they hadn’t shifted or re-adjusted at all, which is a really good sign that I’ve got the fit down and they didn’t shuffle to a “better fitting” position. The roundpen is a good start for testing, but now I can’t wait to get out on trail and really see how they do! So today’s take-away lesson? 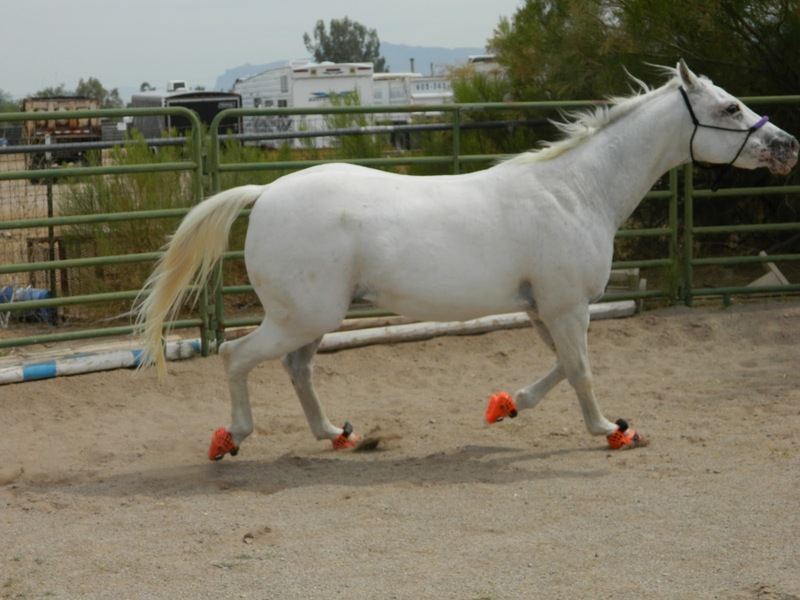 Horse’s hooves can change, even ones that have been barefoot for a while. Periodically check and reassess boot fit and sizing. Oh, yeah, and I love my Renegades. I love the orange boots! I currently am using shoes on my riding horse, but tonight I -discovered my mare with the hoof troubles (keratoma-surgery-hoof crack) had pulled off her eggbar shoe. 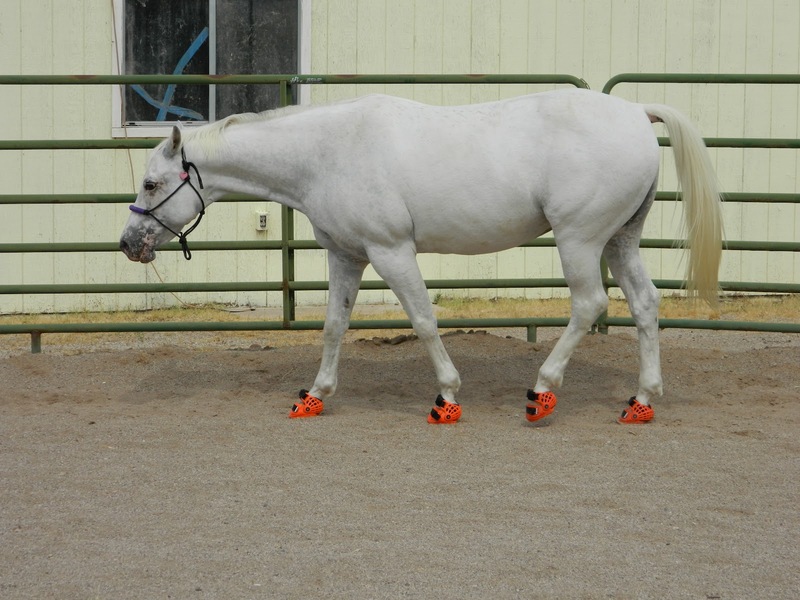 Luckily she can fit into Dazzby's Renegades so she is currently wearing a bright orange hoof boot. She's black, so its a great color combo! The orange looks fabulous with black horses! Well, I'm biased and tend to think they look good on any color :) but they're particularly striking on blacks and greys!